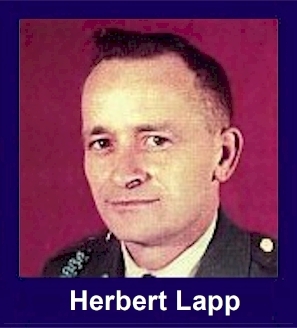 The 35th Infantry Regiment Association salutes our fallen brother, SSG Herbert Lapp, who died in the service of his country on July 3rd, 1966 in Pleiku Province, Vietnam. The cause of death was listed as Small Arms/AW. At the time of his death Herbert was 43 years of age. He was from Jamestown, North Dakota. Herbert is honored on the Vietnam Veterans Memorial at Panel 08E, Line 125. The decorations earned by SSG Herbert Lapp include: the Combat Infantryman Badge, the Bronze Star with V, the Purple Heart, the National Defense Service Medal, the Vietnam Service Medal, the Vietnam Campaign Medal and the Vietnam Cross of Gallantry with Palm Unit Citation. At the time of his death, SSG Lapp was living in Grangeville, CA with his wife Juanita, a step-son, and a step-daughter. SSG Lapp also served in WWII and had a brother Edwin who was killed in the Korean conflict. SSG Lapp parents were Philip and Mary Lapp. The family originally consisted of seven brothers and nine sisters. SSG Lapp is buried in the Grangeville cemetery, Armona, CA. A thanks to SSG Lapp's sister Betty Schilling for this information. He was born in Jamestown, Stutsman, ND on Feb. 1, 1923. He married Juanita Hardcastle on Jul 2, 1960. His two stepchildren (Juanita's children) were Diana Rae Herbrand and Marcus "Mark" Emery Herbrand. Herbert was my ex-first sergeant while I was in the Army stationed at Ft. Lewis, WA, and I was married to his stepdaughter Diana for 10 years. General Orders 38, Award of The Bronze Star For Heroism, 3rd Brigade Task Force, 25th Division, 30 July 1966. For heroism in connection with military operations against a hostile force. Staff Sergeant Lapp distinguished himself by heroic actions on 3 July 1966, in the republic of Vietnam. On this date, Staff Sergeant Lapp was serving as a squad leader in the 3rd Platoon, B,1/35th Infantry. While moving with his squad to reinforce a part of his platoon already engaged, his squad was brought under intense automatic weapons fire from a dug-in company of North Vietnamese soldiers. Realizing the danger of the situation, Staff Sergeant Lapp moved aggressively against the enemy positions and received a rifle wound in the hand. Refusing aid for his wound and with complete disregard for his safety, Staff Sergeant Lapp attempted to maneuver his squad against the enemy. In this final valorous act he lost his life to enemy automatic weapons fire. This outstanding display of aggressiveness, devotion to duty, and personal bravery is in keeping with the highest traditions pf the military service and reflects great credit upon himself, his unit, and the United States Army.